DRY FLY FISHING IN RIVERS. At the beginning of this century, there were two major dry fly fishing schools. In the first school, F.M. Halford dictates straight rules. He was an uncompromising leader, mostly fishing in the famous chalkstreams of Southern England . Before all, a fisherman had to be a "purist". He was allowed to cast to rising fish only, this active fish being of course a trout. Moreover, he had to use an artificial fly matching the natural insect. The fisherman had to precisely identify the hatch and select his fly carefully. Fantasy flies were rigorously forbidden as well as fishing the water without seeing any rise. The second philosophy was less rigid and more adequate for fast rocky rivers where massive ephemerids hatches are not so common. In those rivers, it was admitted to fish any well known trout lies, and this also when the fishes were not active. To be honest, if fishes were so demanding about the details of a fly, none of ours would have ever been taken. Just compare an artificial fly with a real insect to be convinced! Moreover, the stream and the wind on the surface of a river modify the image of the fly drastically, as well as its shape and sharpness. Actually, we do not have a precise idea on how fishes see our flies. It is probably very different from the way we are looking at our flies in the nice aluminium box. Although active fish can be caught, it can sometimes remain quite difficult, but there lies the challenge. Your experience, your observation skills, even your imagination have to be used. Thats why fly-fishing is such fun. A very good fisherman is not the most experienced one, neither the most dextrous one - certainly not the most equipped one! - but the one who can remain concentrated during hours on end, remaining confident even after many unsuccessful attempts. You have to believe in what you do, especially for fly fishing! A good fly has to float as high as possible on the water and in an horizontal plane. Thats the reason why flies on short hooks tied "palmer" style are so popular. It is especially the lateral and back fibres of a hackle that maintain the fly afloat, these have to be elastic to curve and support the weight of the fly. A couple of synthetic fibres of light colour (white for example), imitating the wings, tied on the back of the artificial, can be an advantage. It is the first signal that the fish will see in its observation window, moreover it can be very useful when the visibility is low. Another interesting pattern is the "parachute" style. These flies are very attractive and are floating very well in any circumstances. In addition, you can tie those flies with hackles of average quality, and the size of the hackles can be less precise, being corrected with a pair of scissors. Generally, hatches happen when there is an increase in water oxygenation : hatches are rare when the weather is hot and sunny, more abundant when cold and rainy. If hatches are small, flies are seldom found on the river, therefore the use of a generic fly having some features of the natural insects is recommended. The fishes are not very intelligent, they are "programmed" to react positively when they recognize the general characteristics of an organism they are used to feed on. The curiosity plays also an important part in the trout behaviour. The mouth is actually its unique catching and sensing tool. Use the voracity of the trout to provoke an attack, by casting near a trout. If the cast is light, and the fly goes down nicely, the trout will not be afraid and might catch your lure violently. Sometimes, fishes take only a specific fly pattern and refuse everything else. This happens especially during massive hatches of a specific insect. Do not waste your time changing your flies indefinitely. Use one of your well-known patterns, having some characteristics of the emerging flies. Do not insist too long on a specific reluctant fish, you would better off trying another one after a couple of good presentations of the fly. If nothing works, you can try a fly very different from the natural insects, sometimes it works. Tough fishes often require small flies, even very small flies. The imitation is maybe less accurate in these smaller size. 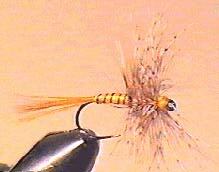 Even during hatches, I used to choose smaller flies than those drifting on the river. A big fly is generally not so well taken. Fishes have short-term memory. If you miss a fish with a fly, it will probably refuse the same fly later. Just try another pattern, it might take it. This is typical with the graylings, that are less and less interested in a fly after each new presentation. Take another fly, and you will see an immediate renewed interest. Big fishes have a better memory, that explains probably why they have survived... Any fishermen have met one of those very suspicious fishes that stop rising after the first presentation of your fly, and refusing to pay attention to all the flies that drift above their heads. More important than the choice of the artificial fly is its attitude on the water, this will be the key of success or defeat. A big leader might induce a drag of the fly on the surface, causing consequently a refusal. 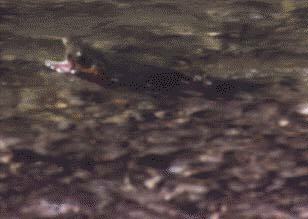 Notice that a drag can be positive with large flies, especially caddis. Those flies are used to rush vigorously before they take off, making them more attractive for the fish. Your fishing tactic will depend on the type of stream you are fishing, small or large, slow or divided in multiple fast water pockets, full of vegetation or running across the meadows. Upstream, downstream or across the river. If you have the choice, I advise you to fish upstream, especially with short casts. You will be out of sight from the fish, the strike will be better because you will not take the fly out of its mouth, and the fight will not disturb other fishes upstream. Finally, the fish has also to swim against the stream during the fight. Fishing upstream requires to pay special attention on the leader and line that might drag above the fishs head. Try to use a 45_ angle to decrease this problem. Horizontal casts reduce the movements of the rod and allow a better presentation of the fly coming before the leader. If a rise has been localised, you should cast your fly as quick as possible. Some big trouts are used to take flies at regular intervals, hence you have to measure the time between rises. It is better to cast your fly directly where you think the fish lies, especially to decrease the duration of the drift and the probability of drag. However, you should not cast your fly on the nose of the trout, either a little bit upstream or aside. If you are not sure about the trout location, wait for more rises. A rise in the middle of a large river is often difficult to locate precisely. Do not forget, that your first cast is always the more productive. If the fish has risen to your fly without taking it, you should better wait for another rise before trying again. If it does not work and the fish has not been scared, try the same fly but smaller. The fishes are always easier in fast running water than in slow parts of the river. In the latter the fish has plenty of time to scrutinise your fly and decide whether to take it, whereas in the former you can also get closer without disturbing the fish. The irregularities in the surface, the ballet of lights and shadows make the fisherman's silhouette less precise and the noise created when you are wading in the river is lost in the agitation of the streams. 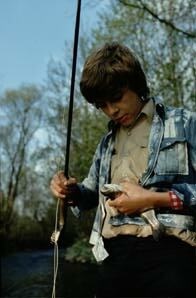 I prefer the waders with felt sole compared with those equipped with nails, chains or other metallic devices. In the slow area of the river, pay attention to the waves you create when wading. They could alert a fish, who will alert all the other fishes around. I have remarked that the trout rising close to the bank are easier to catch than those in the centre of the river. Is it because there are few insects drifting above or because of a shorter time to examine them? If overhanging trees or bushes make casting more difficult, it could well be that this part of the river is less fished. A good trick is to send your fly upstream on the bank, pull it and the fly will directly be near the trout, this movement most of the time induces the attack. Remember that the refraction principle will modify the exact location of a fish. 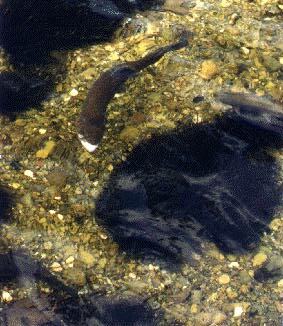 When observing a fish in the river, it is actually nearer than where you see it. Therefore, you should make shorter casts to avoid disturbing it with you line and leader. The same phenomenon will modify how the fish sees you : objects appear smaller and shapeless if they are further away. A 1m80 fisherman, wading up to the waist, and 4 meters away from a fish 30 cm under the surface will have a size for the fish of 30 cm! If behind you, there is a dark background, your silhouette is almost invisible for the fish, especially when wading. Therefore, you can get very close to the fish. On the other hand, casts of more than 12 meters are tiring and not very efficient. Precision during the strike is not possible and drag is difficult to avoid, it is difficult to observe the fly, and you might no see a fish that was interested by the lure but refused to take it. Long cast will also alert all the fishes in the area. Drag and the visibility of leaders are the most important reasons for refusal. The straight line created on the surface is a cause of failure. Instead of using leaders with small diameters, you can try to dissimulate your leaders by using special casts, downstream, curved, from the side, to increase your chances by 100%, try to sink the last 15 centimetres of the leader using claypap, glycerine or cleansing agent. This treatment is only required if you are fighting a special fish because its action will quickly disappear and it may become boring repeat this process frequently. Once again, the value a fly is not more than the value of the fisherman, and the way you give is more important than what you give !